Since VidCom’s inception in 1980 Broadcast has been at the core of our business. 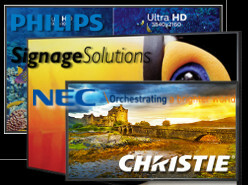 VidCom sells and supports a complete range of Broadcast Products. Video Production is a very integral part of VidCom’s business since the beginning. Whether it is a Studio or Mobile Production we provide turn-key solutions backed by full after sales support. VidCom was one of the first companies to specialize in providing solutions for Streaming & Encoding in Canada. In the past five years this has become a big part of our business. Avid, Apple Final Cut, Assimilate Scratch & Davinci Resolve are world leaders. VidCom’s Editing & Grading systems are tailored to customer requirements and are fully customizable. In the current Era most of the productions want to access data very quickly, this has made the use of Shared Storage almost mandatory. VidCom recommends and supplies scalable, platform independent high bandwidth storage. With thousands of files being created during every production, these valuable assets need to be reliably backed-up and archived. VidCom specializes in various solutions for Data Back-up and Archiving. VidCom provides the necessary tools (Hardware & Software) and training to calibrate your monitors, plasmas, LCD’s and projectors in every kind of set-up. Whether the application is 3D, 4K, 2K or HD we have a solution for you. We sell and support small portable waveform scopes, test generators for portable applications to full-blown Rasterizers, Vectroscopes and Sync Generators for Broadcast applications. VidCom is leading supplier of Professional lights for Video Production, Corporate Video Conferencing and Portable Lighting Kits. VidCom specializes in LED & Fluorescent Lighting which is cool and energy efficient. VidCom carries a full line of Video & IP routers backed by great support and advance replacement programs. We also supply the entire range of equipment required for any kind of install, whether it is for a Mobile or a Studio.